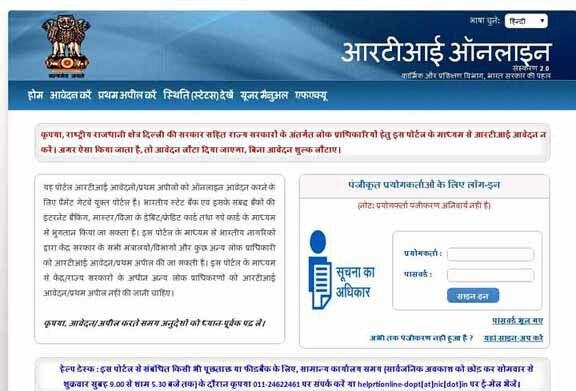 New Delhi : RTI online portal which was launched for online filing of RTI applications, in August 2013, will be converted into Hindi language as well. The Department of Personnel & Training (DoPT) of government said on Monday. Presently. The RTI online portal is available in English language only, which will be soon allows to use in Hindi language also. The Department of Personnel & Training (DoPT), said in an order issued today, "the RTI online portal which was launched in August 2013 by DoPT for all Central government ministries/departments with a view to provide a facility to citizens to file RTI applications and first appeals online." Till now, 463 public authorities have been aligned to the portal. It is proposed to extend the RTI online portal to more public authorities and also to make technical improvements in RTI online portal during the next year, as per the action plan 2016. "Making RTI online portal available in Hindi language as well. Mobile application for RTI online portal. NIC has already developed it for Android platform since 70% of the smartphones users have Android system. Payment gateways is yet to be provided by the State Bank of India," said DoPT in the order.